Puja Rios, Puja's warrior perspective is critical to both her success managing her Chronic Pain and her continued climb up the corporate ladder. 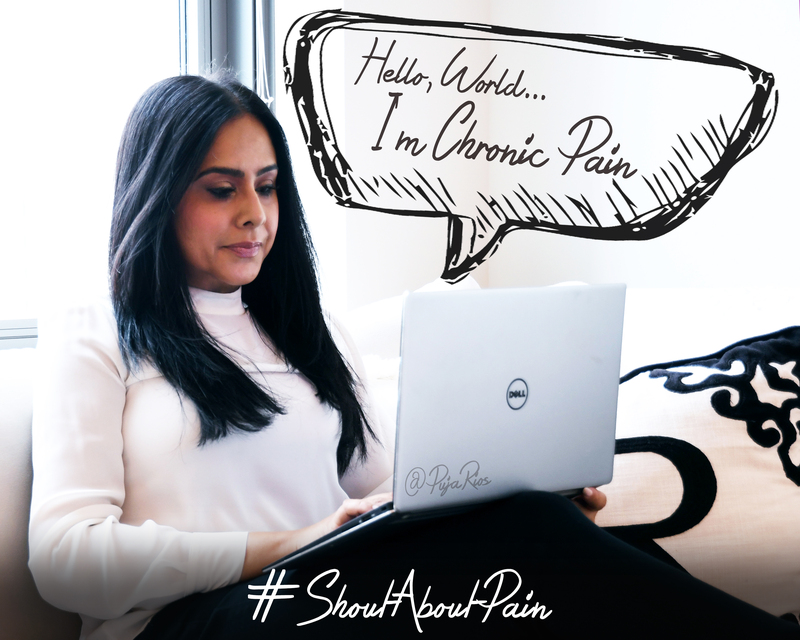 As Pain Awareness Month in the United States comes to an end, I’m parlaying its energy and intention into a new project called, #ShoutAboutPain. This shiny and new blog series is going to skyrocket awareness and end the tired stigma of Chronic Pain (CP) — globally. On a scrolling list of frustrating components on my CP journey, confusion is at the top. I’ve never known where to turn for anything. Where do I go to educate myself? What should I read? What else should I plan for? What are the best treatments? Who are the leaders in this community? Really, who’s in charge here?! After almost ten years of dizzying research, I had a lightbulb moment; if I can’t find the answer, I have to drive change through partnerships! Let’s connect the work of Chronic Pain experts, doctors, patients, and advocates. With passion and determination, I’m bringing people and organizations together, who have CLEAR missions and strategies for combating and managing this pain circus. Why do I think I’m the warrior for the job? I’m a devoted Chronic Pain survivor and advocate. These illnesses have eaten away at the fabric of my being, having destroyed who I once was, and forced me to rebuild my life, day after day, year after year. I know Chronic Pain can be isolating, depressing and for some, shameful. Due to a car accident that resulted in the last vertebrae in my back breaking, and herniated discs in my neck, Fibromyalgia, Rheumatoid Arthritis, Chronic Fatigue Syndrome, Sjogren’s, Eczema and Psoriasis have become my (unsavory) jam. If you saw me, you would never know how much I suffer. I am a wife, daughter, sister, and aunt. I run a P&L with a large staff. I am the founder and former chairwoman of my company’s Women’s Alliance and sit on an executive board at a large non-profit. I write for The Huffington Post, The Mighty, New Life Outlook and now, Thrive Global. I, along with 25% (over 1.5 billion) of the world’s population, suffer from debilitating pain. EVERY. SINGLE. DAY. The idea that if you can’t see my pain, it doesn’t exist, needs to be put to rest. “Chronic pain is a common complaint in industrialized countries and constitutes a major public health and socioeconomic problem. Estimates of its prevalence in the general population range from 10% to 50%, depending on the definition of chronic pain applied and the population studied. So, how did we get here? A bigger-than-before aging population (who are more prone to illness and disease), growing chronic conditions (like cancer and diabetes) and an increase in surgical procedures, all contribute to the explosive chronic pain rates we’re going to exploit. Well, fellow warriors, it’s time to #SHOUTABOUTPAIN! In this series, we’re going global to uncover the stubborn truths of Chronic Pain. We’ll address topics like the need for opioids, alternative treatment methods, how to find support in your area and how to find better doctors. I’ll also be sharing your personal success stories of thriving with chronic pain, we’ll hear about your worst flares (and what you learned from them), and we’ll keep tabs on the future of pain management. New pain treatment methods are becoming more popular as prescription meds present undesirable side effects and access to opioids is limited given new gov’t restrictions. New options include: physical therapy (48%), lotions & rubs (45%), meditation (31%), acupuncture (15%), and over-the-counter TENS devices (14%). Investment in managing and treating pain costs anywhere from $600 to $3,000 a year. Measuring pain relief varies based on the individual, where a treatment is successful if it increases physical activity (58%), improves quality of sleep (58%) or improves mood (37%). What will make this project different, is in its’ name, #ShoutAboutPain. As I mentioned, I want to hear from YOU. In my lightbulb moment, you were there too. As we start building bridges of information with our stories, from all over the world, soon, nothing can fall through the cracks. If you would like to be in on our mission, I’ll be crowdsourcing information through this blog, my Facebook and Instagram, and public speaking. Connect with me on social media and sign up on my website to share your opinions and insights, answer polls, and for updates on how we’re changing the Chronic Pain world. Puja Rios is Vice President of Sales at a top-ranked human capital software organization and the founder of her company’s Women’s Alliance, CareerBuildHER. In addition, she sits on the Executive Board of Bright Pink and prides herself on her work as a Chronic Pain advocate and blogger. Her mission to rebrand Fibromyalgia and Chronic Pain has led her to be recognized as Fibro Daily's #1 Fibro Awareness Advocate, WEGO Health's 'Best Blog' and 'Rookie of the Year' finalist, and presenter at the 2018 HealtheVoices Conference. By working with top doctors through trial and error, Puja has dissected and revealed the endless effects of Fibromyalgia and Chronic Pain. Puja uses her voice to support over 100 million Americans diagnosed with these illnesses. She is the author of the Huffington Post feature blog, 'Me vs. Fibromyalgia,' as well as a contributor to Thrive Global, The Mighty, and New Life Outlook. Puja's warrior perspective is critical to both her success managing her Chronic Pain and her continued climb up the corporate ladder. Puja is proof that you can thrive despite intrusive disabilities like Fibro and CP.